Accessibility to the ad platform is free, but the ads are sold based on the cost per click. The opportunity came without direction from Amazon on how to use the option, George said. It’s not unusual for Amazon to omit directions on how to use a feature during the test phase, whereas Google usually posts some sort of direction in a blog. 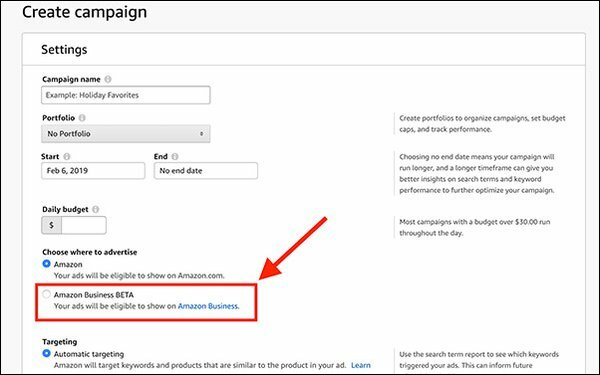 Ads from the consumer marketplace can appear in the business marketplace, but this is the first time an advertiser can specifically choose to show their product on the Amazon business marketplace, he said. George said that previously a company selling staples could not advertise to the business looking to purchase office supplies in bulk. Now brands that sell products a business is likely to buy can target ads to those who have registered on the business marketplace. George said it might make sense for brands selling through Seller Central to duplicate all campaigns and run them in both the consumer marketplace and the business marketplace. In September 2018, Amazon Business said that in the U.S. it serves nearly 80% of the 100 largest enrollment education organizations, 55 of the Fortune 100 companies, more than half of the 100 biggest hospital systems and more than 40% of the 100 most populous local governments. Search Marketing Daily reached out to Amazon and will update the article with additional information.